Published on 2 August 2012. This year, we are – of course – celebrating the Queen’s Diamond Jubilee. 125 years ago, our forebears were celebrating Queen Victoria’s Golden Jubilee. As part of those celebrations, a Royal Jubilee Exhibition was held in Newcastle, in the specially created Exhibition Park. It proved phenomenally successful, with over two million people visiting. 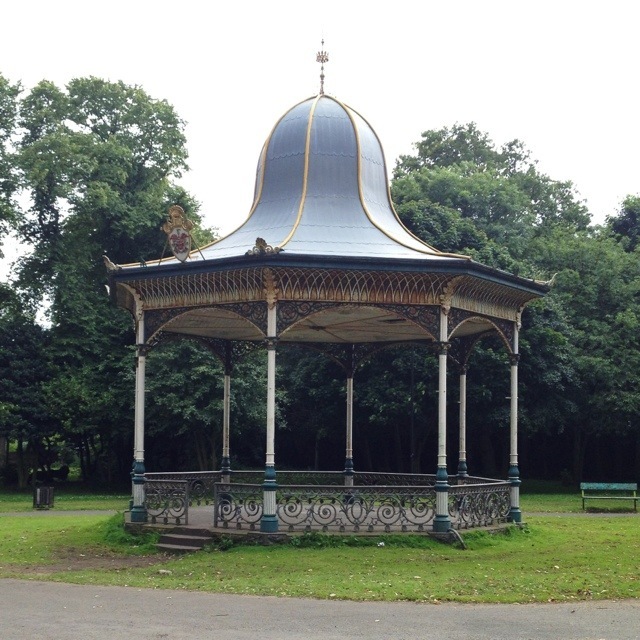 Other than the very existence of the park itself, this band stand is the only remaining remnant of the Royal Jubilee Exhibition – note the crest above the entrance, and the crown around the spike at the top! It was cast in iron from a Glaswegian foundry, and it’s now Grade II listed. This 1,750th post was filed under: Photo-a-day 2012, Exhibition Park, Newcastle-upon-Tyne.